Apple’s iPhone X is due to be revealed later today, but it’s apparently already started to hit the benchmarks. Shocker: it’s fast. Like, insanely fast. 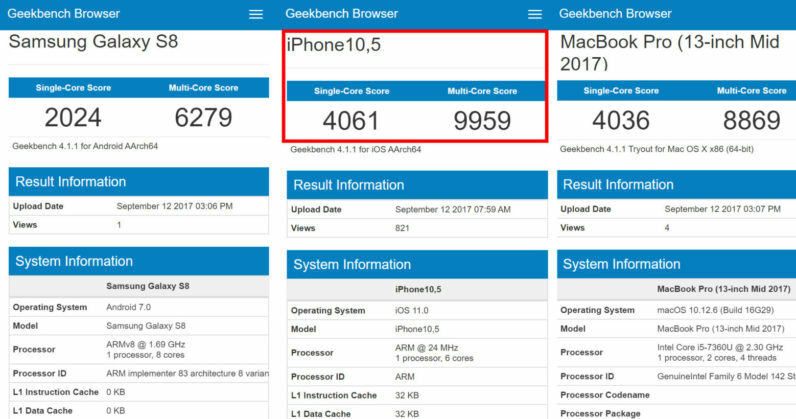 A mysterious ‘iPhone10,5‘ showed up on Geekbench’s catalog today, and assuming it’s not somehow a false entry, it’s posting speeds that are way faster than anything Android’s current generation has to offer: a 4095 on the single core test, and 9959 on the multi-core one. Of course, it also far surpasses last year’s iPhone 7, which scored a 1825 on the single core test and a 3118 on the multi-core one. Granted, benchmarks aren’t everything, but it’s not like we expect the iPhone X to perform poorly despite good benchmarks. This test also seems to confirm recent leaks that Apple is increasing the core count from two to six with a new A11 chip. Two of the cores are meant to do the bulk of intensive processing, while the other four are high efficiency cores dedicated to low-power tasks. So yeah, Apple’s apparently built a smartphone that’s faster than a 2017 laptop, at least by GeekBench’s metrics. Technology, amirite? Follow all our coverage of Apple’s iPhone X event here. We’re also hosting a live chat, in which we’ll discuss the new products and updates: join us on this page.